A fairly recent trend that has been picking up momentum in the powered parachute and paragliding communities is Custom Canopy Artwork. Customized designs, logos, text, phone numbers, website addresses, and a whole host of other artwork have found their way to the bottoms, and even sides, of many canopies. It makes a lot of sense. After all, a parachute is essentially the size of a billboard. What better way to draw attention to one’s self than by placing unique and eye-catching artwork on such a huge surface. More importantly, many small business owners and professionals who purchase powered parachutes and paragliders realize the tax benefit of placing a logo or a business phone number on their chute as a promotional write-off. But there are many issues to be looked at before making a decision on customizing a canopy. What are the legal and tax implications? What types of parachutes can or cannot have artwork placed on them? Can you put artwork on used canopies? What will artwork look like in flight? What are the various ways of putting artwork on a canopy? What are the benefits and drawbacks of those different ways of applying artwork? How much does it cost? Answering these questions will help you decide if canopy artwork is right for you. Everyone knows about the basics spelled out in FAA part 103. Ultralights are to be used for "sport purposes only." Okay, so we fly two-seaters for "training purposes only" and we only fly "trainees," right? No "rides" for hire, no aerial photography, no advertising – those are the rules. Airmans’ Advisory Circular (AAC) 103-7 spells out more specifically what is meant by all that. If you haven’t ever read those definitions, I strongly urge you to look it up on the Web and peruse it for your own benefit. But even though the rules are mostly spelled out, there are a great number of gray areas. There are so many ways to look at the definitions of the rules. The truth is that even the FAA determines the rules differently on a state-by-state basis. The Flight Standards District Office (FSDO – often pronounced "Fizz-Doh") in one location may come up with an entirely different interpretation of what "advertising" is than another FSDO in another state. Identifying an aircraft is perfectly legal. If you put your name on your chute, it would signify that the chute belongs to you and would be no different than putting a name tag on a shirt. If you or your company own the aircraft, and you put an identifying mark, such as a company name, logo, web address, or the like, chances are no one will bother you. A phone number is usually okay. But sometimes you may need to register the phone number as a "Service Mark" or SM, to be a legal "identifier." Crossing the line comes when you start putting messages on the chute that are not part of your logo. For example, "Eat At Joes," unless that is the actual name of the restaurant, would imply advertising, and would probably be looked at as being illegal by most FSDOs. It goes beyond identification and into the realm of sending a message, which is advertising. Implied therein is the simple fact that you cannot fly someone else’s logo for hire on your canopy. There is one organization that I know of which has an FAA exemption as a non-profit that can sell sponsorships for donations to fly a logo on canopies owned by the customers. The organization can register others on their exemption, but the details are complex. Other than that, I don’t know of any way to fly a logo that is not your own on your aircraft which will be recognized as legal nationwide. From a tax perspective, if you own a chute with a logo on it and fly it around, it is a write-off as a "Promotional Expense or Asset," which is a little different than advertising. Placing a logo in front of people doesn’t necessarily send a message, but it does give off an image, and that is useful to many businesses. In that way, you get the write-off, plus the mind-share of your viewers, without crossing the line into blatant advertising. Indeed, many people can write off their entire aircraft as a promotional asset. Check with your accountant for the specifics of the tax issues. The flight rules apply regardless of the advertising issues. If you are flying below 1000 feet over a crowd, you are flying illegally. You cannot "buzz" your audience and get away with it long-term. Flying over a beach, as long as you are out over the water, is fine (as long as you are at least 500 feet from anyone or any man-made object). Take-offs and landings are also obviously exempted. Still, be smart about it. If you’re not being a nuisance to anyone, and you are flying at a safe altitude for the surroundings, chances are no one will bother you about it. Most FSDOs don’t bother with powered parachutes in general, since they don’t fly out of standard airports and are relatively safe aircraft. If you use your head, you’re likely to be okay. If not, and you have a logo or an identifying mark on your parachute, you may be asking for a phone call from the authorities. Rip-stop nylon is the primary fabric used for parachutes and paragliders. Even though there are many different types of nylon in use by canopy manufacturers, a few principles about all para-wings are constant. Canopies are translucent. This means that they allow light to shine through them and show the colors in the fabric. Translucency has major implications with regard to artwork. For example, if you have a yellow canopy, and you want to paint it a bright red, the translucency principle will determine that when in flight on a sunny day, the viewer on the ground will see orange instead of red in your design. The same works for any other color combination. Yellow and blue make green. Blue and red make purple. Green and red make brown. Black is usually opaque, and so black on anything is black. Translucency also has other implications with regard to light transition. Light transition refers to how much light transitions through the fabric to the viewer below. If your background is a darker color, such as purple or navy, less light will transition through the layers of fabric to the bottom of the unit. Thus, if you paint a light color onto a darker one, the lighter color will not be seen, since the darker color has already blocked most of the light transitioning through the canopy. Sometimes I get requests to place white artwork on the bottom of a black chute. The problem with that is that there is no light transition through black, so the white, even if it is opaque white, will be shadowed too much to be seen. Opaque colors only work if there is light shining onto them, since no light can shine through them. Opaque colors on parachutes are almost never visible, unless the color is black on a light surface, in which case you are simply using the black to create a shadow, which is what the viewer sees from below. The ideal color for parachute bottoms which will have logos applied to them is all-white, followed by a light yellow, blue, green, pink, or orange, if the color of the artwork is unaffected by the background. The top of the canopy can be almost any color, but I recommend lighter colors. White gets dirty and shows the dirt, so I don’t always recommend an all-white canopy. A light blue is usually the best, since the sky is blue and the light transition from the top layer of the canopy to the bottom is consistent with the ambient light of a blue sky. Striped canopy tops are fine as long as the stripes are not a too-dark color. Sewn-in designs can integrate the design as part of the fabric of the parachute, and are not as dependent on the background. However, translucency from the canopy top can still affect the color quality of a design sewn in to the bottom. This process is expensive, but is offered by many parachute manufacturers. Although many types of canopy fabrics are available from a wide range of manufacturers today, the two main types when considering artwork are zero-porosity and paraglider fabric. More manufacturers are going to a paraglider fabric these days, partly because of its stiffness and ease to inflate, as well as its performance. However, zero-porosity canopies tend to last longer and have excellent flight characteristics, as well. In terms of artwork, when dealing with zero-porosity fabric, the only option commonly available is to have the manufacturer sew in a design at the point of manufacture. Silk screening may or may not work on zero-porosity fabric, depending on the specifics of the material itself. When it comes to paraglider fabric, more options for artwork are available, including sewing, silkscreen, adhesive lettering, and painting. In addition, paraglider fabric can have artwork added in the form of adhesive lettering or painting at any point in the useful life of the fabric. As long as it is clean, a used parachute with paraglider fabric can have artwork applied to it. Both types of fabric are equally translucent across the color spectrum, with the same principles of translucency applying to both. In flight, you want to be able to fly at a safe altitude, but you also want people to see the artwork you have on your canopy. Common sense dictates that the larger a design, the more visible it is. But that is only partly applicable on a parachute canopy. Too much detail is often not visible at a distance. Remember too that the canopy is arched, meaning there will be some distortion to the viewer from an angle as opposed to being directly below the aircraft. Generally speaking, the same principles apply to road-side billboards as do for parachutes. If you can see a billboard 1/4 mile away and read its details well, you’ll be able to do the same for a parachute at an altitude of about 1300 feet. If you have a 10-digit phone number (SM compliant) you want placed on a chute, then the numbers using the most visible font (Arial or Tahoma work really well) will be about 4 feet (plus or minus a few inches) tall, going from useful end to useful end. By "useful" ends, I mean that the end cells are virtually vertical during flight and are not very visible to someone directly below the aircraft. I recommend running a logo inside the outer two cells. A cell, by the way, is defined as two sets of "pockets" or seams, running from leading to trailing edge. 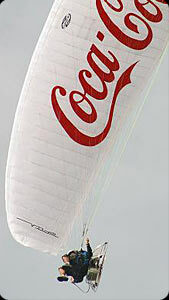 To date, there are four major forms of applying logos and artwork to parachute and paraglider canopies. They are sewn-in, silk-screened, adhesive, and painted. Let’s look at the different types and go through each one’s benefits and drawbacks. Price ranges stated are for most types of artwork in demand, although more expensive artwork is possible with each type of method. Many manufacturers sew in designs for their customers prior to delivery of the parachute. Most sewn-in designs must be applied to new parachutes, since the design is integrated at the point of manufacture. The benefits to sewn-in artwork are that the design is very precise, with clean edges, and that it can be done on zero-porosity canopies. In addition, there is little limitation as to what customization the rest of the parachute can handle without affecting the artwork. For example, if you wanted a skull-and-crossbones in white on a black canopy, it is best done by having it sewn in to a black canopy. Sewn-in designs do not weigh very much, usually under 16 ounces. The main drawback is price. Sewn-in designs are very expensive, costing up to five times as much as other methods. Another drawback is the fact that every stitch punctures the fabric, and this can lead to degradation of the bottom of the parachute sooner, as well as causing puckers and flight-altering distortion of the canopy. Eventually, this has the potential of being dangerous. Also, it takes a long time to get a sewn-in design, adding several weeks to the delivery time of the order. The silk screening process uses heat to apply an applique to fabric, essentially welding a design onto fabric. The benefits to silk-screening are that it is a very precise way of placing artwork onto a canopy. It is less expensive than sewn-in designs. Silk-screened designs do not easily come off the canopy and are as permanent as any form of artwork. Silk screening is light-weight and can be done fairly quickly. The drawbacks are that, even though it is less than sewn-in, silk screening is still expensive. Also, the heat from the process can damage fabric at a microscopic level, weakening the material over time. Silk screening requires the lines to be removed from the canopy before application. Finally, silk-screening is affected by translucency and requires an appropriately colored background. The adhesive process is used by many individuals and manufacturers. It involves placing a precision-cut piece of artwork fabric (usually vinyl or nylon) onto a canopy with a strong adhesive. The adhesive process is used primarily for text and numbers. The benefits are price and simplicity of application. Adhesive artwork is among the cheapest form of artwork, especially if it is applied by the owner of the canopy (which is the only form of artwork that has that potential). It is precise with clean edges and is effectively visible from the air. It can be removed (although the adhesive residue is difficult to get off), meaning that the artwork need not be permanent on the canopy which makes selling a used canopy a little easier. The drawbacks are that the expense is saved only if the owner applies the artwork. This requires several hours to do correctly and can be a mess if any mistakes are made. The adhesive has a tendency to lose its stickiness on the edges over time, allowing dust and dirt to collect. Eventually, the artwork starts to flap in the wind, causing aerodynamic anomalies in flight. If any artwork other than text and numbers is required, then the lines must be removed from the canopy prior to application of the adhesives. Translucency is an issue. Adhesives are the heaviest form of artwork, sometimes adding pounds to your canopy. Painting involves hand brush-painting of a design onto a canopy. The process can only be done on paraglider fabric and uses a water-based paint. The Xtreme Ads process and paint is the only one I know about. So, it is the basis on which these facts are mentioned. Other paints or processes may not have the characteristics mentioned. Benefits include price, being the least expensive form of artwork behind owner-applied adhesives. The designs are lightweight, weighing 2-8 ounces total. There is never any damage done to the canopy fabric or flight characteristics, and the colors are true. The designs are accurate, especially in flight. The paint never chips, peels or fades. The lines do not need to be removed, and the artwork can be applied to used and new canopies alike. Turn-around time is the fastest of any form of artwork application, sometimes as little as 24 hours. Drawbacks include translucency issues, as well as precision issues. You can see brush strokes in the design on the ground, and the edges are not perfectly clean. Because it is hand-painted, these are unavoidable effects, even though they are not visible in flight. Extreme detail is a limitation as well. People’s faces are very difficult to get right on a canopy with hand-painting. Also, the design is permanent and there is no way to remove it once it is painted on. The greatest aspect about customizing your canopy is the uniqueness your design reflects about you. If you use it for a promotional write-off and as an excuse to let your spouse let you get the aircraft to begin with, then more power to you. As the trend continues, it is possible that everyone will have unique artwork, for business or pleasure, on their canopies. Some may just want to support a sports team or a charitable organization with artwork representing those entities. Others may want an American Flag (which are very popular designs). There is no limit to the kinds of designs that can be put on canopies. With the uniqueness of the pilots in the sport will come the uniqueness of the artwork expressed in the skies. And what a great way to promote the sport! The more people look up and see cool artwork and long to be up there themselves, the more the sport will grow. Fly safe, fly legally, and for goodness’ sake, fly with style.